ADRIEN ARPEL (stock market ticker symbol: ADPL) received much acclaim for introducing the European facial to an eager U.S. market in the 1970's. The company soon became a household name for women seeking top-of-the-line skin care products and services. 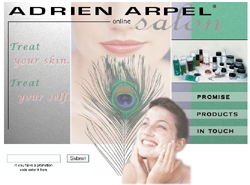 Today, Adrien Arpel is one of the most respected skin care lines in the world, and Adrien Arpel products are available in most upscale department stores and select salons. Oh my gosh � you are amazing � incredible � WOW � always a better job than I expect � you are spoiling me! You are the most thorough person I know. What would I do without you? I love the new design to your website. It is so much nicer and user friendly. LOVE THE NEW SITE !!! ED KOWALCZYK is the lead singer of the rock band, LIVE.Their music was recently featured on The Tonight Show and in the box office movie smash, "The Mummy Returns", they won Billboard's Rock Artist of the Year award in 1995, and their recent Secret Samadhi album debuted at the #1 position on the Billboard charts . "Chris Tong is an excellent person to have running your show on the World Wide Web. The site that he helped design and edit for me has garnered more attention this year than I could have possibly imagined. Not a day goes by that I don't get a comment like, 'Wow, your website is incredible, what an oasis on the internet!' I highly recommend him and ." 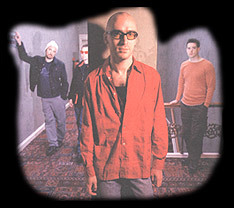 "Maintained by Live's singer Ed Kowalczyk, Hole in the Universe is an all-out assault on your eyes, ears, and soul. Stunningly well-designed, the site posts daily tour diaries, interviews, backstage and early home photos of the band, and samples of art they enjoy." ALOHA BAY is the third best-selling manufacturer of candles in the Northeastern United States. We designed their corporate site, www.brightlightscandles.com, as well as a site featuring their Aloha Bay line of candles: www.alohabay.com . A "Fijian / Hawaiian" design theme was requested. "It's the most beautiful site I've ever seen. Everyone here at Aloha Bay Candles loves it. I'm going to get all our retailers to take a look at it immediately! I knew you guys were technical geniuses, but it's clear you're real artists as well!" CHRISTINE FEEHAN is the New York Times bestselling author of the romance series, the Dark Series, as well as several other series. Every one of her books has been a bestseller. Her three most recent books, After Twilight, Dark Fire, and Dark Legend have made both The New York Times bestseller list and USA Today's bestseller list. Her first novel, Dark Prince, won 3 PEARL Awards and 2 RBL Romantica awards in 1999. All her books have received rave reviews from devoted readers, esteemed colleagues such as Amanda Ashley, and reviewers from Romance Journal, Romantic Times, New Age Bookshelf, Bookaholics, Siren Books, Romance and Friends, Rendezvous Magazine, and the Reviewers International Organization. Chris, I really love the site!! Just wanted to say thanks. The website is really, really wonderful. Everyone is very pleased with it, especially me. Many compliments from those who have visited or I've shown. An editor for a publishing house called and talked to me today and loved your work, of course I bragged about you! Boy were you getting compliments. My sales rank at both Amazon and B&N went into the three digits and I'm almost certain it was the beautiful design. Thank you so much. I am SO glad I had the good sense to go to you. You're just getting awards all over the place . . . You really deserve this, because almost every email I get mentions my website and how nice it is. 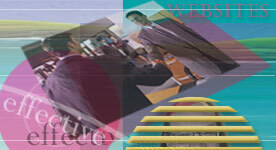 This site is very nicely designed, and contains gorgeous graphics. The author has provided a large amount of content on each of her novels. I am so glad to see such a wonderful site. You are one of my two favorite authors - the other being [ . . .]. Her website was posted as the #1 worst website on webpagesthatsuck.com today; I also find her web page difficult to navigate. I left my opinion � along with many others � in her site's guestbook. I am glad to see that you are so devoted to your fans. 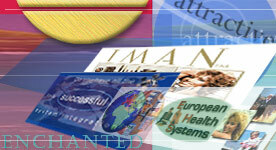 Your site is beautiful and easy to navigate. It can load as easily on a 56k modem or a T3 line. Your site is as beautiful as your works of literature and I for one am thankful.